Bothell, Wa – April 6, 2011 – Last night, Bothell City Council voted unanimously to move forward with the next steps in the potential annexation of 11 unincorporated areas with a combined population of 27,000. Over the past year, the City of Bothell has been conducting research and holding public hearings and open houses related to the potential annexation of areas surrounding Bothell in King and Snohomish Counties. Both counties’ planning policies recognize Bothell as the most appropriate provider of urban services to these areas. The City Council’s vote endorses holding an annexation election in the largest area – 5.6 square miles of unincorporated Snohomish County territory having a population of 22,000 – and annexing the other 10 areas, all but one in King County, by methods that do not involve elections. Bothell’s population is currently 33,505, according to the 2010 federal census. 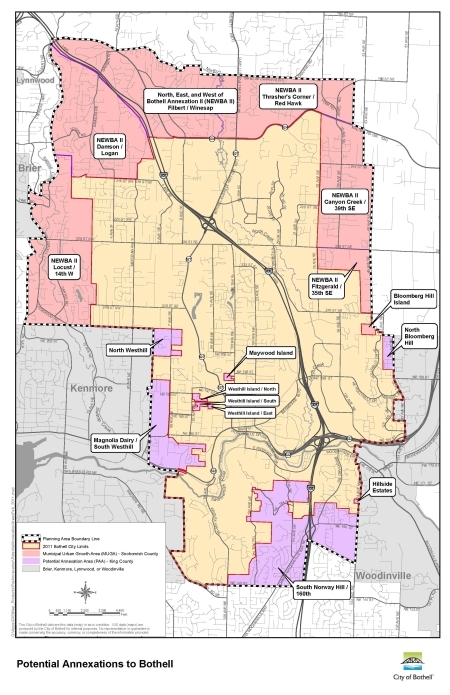 Annexation would add approximately 27,000 residents to Bothell. That would make Bothell the 15th largest city in the state in terms of population. Currently, it is ranked at number 32. Depending on rulings of boundary review boards in both counties and election results, the City could begin preparations to serve new citizens as early as January 2012. The effective date for annexation would then be set sometime between August 1, 2012 and January 1, 2013 to allow time to ramp up services to accommodate the larger population. The process of annexation in Snohomish County was originally initiated in 2009 by citizens who submitted over 1,000 signatures petitioning for annexation election. The Bothell City Council has since made exploring annexation of all of Bothell’s designated potential annexation areas one of the Council’s top goals, and endorsed a comprehensive two-year program for this purpose. Last year represented the first year of the program. The process consisted of five activity tracks – planning and zoning; public outreach; fiscal analysis; interlocal agreement negotiations with King and Snohomish counties; and interlocal agreement negotiations with affected fire districts. Over two meetings, March 15 and April 5, 2011 the results of these five activity tracks were presented to the City Council, concluding with an analysis of the fiscal implications of annexation. Following the presentation, Bothell City Council adopted a resolution calling for an annexation election in the larger portion of the Snohomish County area. Council also reaffirmed the intent to annex the area in King County via the interlocal agreement method, and adopted a resolution to annex a smaller portion in Snohomish County through the “island resolution” method. This portion of Snohomish County, known as “Bloomberg Hill” is located on the Eastern side of Bothell, just north of the county line. The “island resolution” method can be used when an unincorporated area is surrounded on at least 80 percent of its boundaries by the annexing city. Over its 101-year history, the City of Bothell has grown in size through the process of annexation from 450 acres with less than 500 people at its 1909 incorporation, to 7,735 acres today with a population of 33,505. Annexations have ranged in size from a single lot to six square miles, as, through the decades, citizens in unincorporated areas have sought the services offered by Bothell. Annexation is promoted by the Washington State Growth Management Act which recognizes cities as the most appropriate providers of urban governmental services. Residents in the potential annexation areas are encouraged to visit www.ImagineBothell.comto learn more.